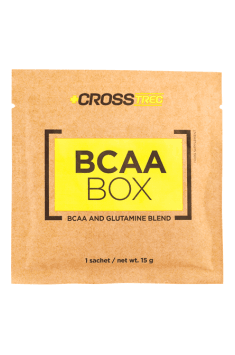 CrossTrec BCAA BOX is a dietary supplement composed of a blend of branched chain BCAA amino acids, glutamine and citruline, enriched with vitamin B6 and taurine. The product is available in handy sachets. Each of them contains one suggested portion of the supplement in the form of a powder which dissolves in water easily. The supplement helps to improve the exercise capacity and increase physical endurance. In addition, it provides a strong muscle pump and accelerates the post-workout regeneration rate. It is recommended for people who are physically active, regardless of the sports discipline and training experience. BCAA (Branched Chain Amino Acids) is a group of amino acids having a branched aliphatic side chain. This condition is fulfilled by three exogenous amino acids: leucine, isoleucine and valine. The access to them should be secured by supplementing from the outside, because the body does not synthesize them on its own. Amino acids of this kind are an excellent building material, they stimulate the synthesis of muscle proteins, and are also involved in the production of hormones and catecholamines. BCAA amino acids support physical performance. They increase a tolerance to intense effort, improve the strength and endurance parameters. Studies have shown that isolated branched chain amino acids work much better than traditional protein supplements. BCAAs reduce the fatigue. Athletes note that thanks to BCAA you can extend the time of physical activity, improve the quality of training and delay the occurrence of the first signs of fatigue. This is the effect of leucine, which promotes limiting the production of tryptophan, from which serotonin is produced. It generates a feeling of exhaustion and fatigue. In turn, valine and isoleucine, after being converted into glucose, can become an alternative source of the energy. The body reaches for them during times of reduced glucose supply and after running out of muscle glycogen reserves with prolonged effort. BCAAs accelerate the regeneration rate. They allow for the faster restoration of glycogen reserves in muscles and liver, inhibit unfavorable processes activated as a result of the intense effort (like breakdown of muscle proteins) and additionally stimulate the desired anabolism. For even better performance, the composition of the product has been extended with the additional amino acids, which should also be included in the supplementation of physically active people. Glutamine is one of the key endogenous amino acids. It protects against BCAAs deficiency and strengthens their action. Studies show that with the decrease in its concentration, the level of branched chain BCAA amino acids is also rapidly reduced. Glutamine promotes effective regeneration and reduces muscle pain caused by the intense physical exercise. In addition, it plays an important role in the work of the immune system and has a positive effect on the condition of the intestines. Citrulline in the presented supplement comes in a perfectly absorbable form of a malate. In the body, this amino acid transforms into arginine which is necessary for the synthesis of nitric oxide. The athletes are aiming at increasing the level of NO, mainly due to the accompanying effect of a powerful muscle pump. A visible increase in the muscle volume is not only a visual effect. In practice, this means that thanks to the improved blood circulation, the muscles gained access to a large amount of oxygen and nutrients. Thanks to this, their exercise capacity increases, you can extend the duration of training and exercise with a greater load. The producer of the presented supplement did enough to ensure that the amino acids contained in it are easily absorbed and used in the system as best as possible. B6 vitamin, which controls the metabolism of amino acids, serves this purpose. In addition, it strengthens the nervous system and is involved in the utilization of homocysteine, which is disadvantageous for the circulatory system. Taurine performs a similar function. The researches indicates the synergy of its action with BCAA. It turns out that this combination of amino acids effectively relieves the muscle pain and reduces the degree of damage caused by the intense physical exercise. This is mainly due to the anti-inflammatory and antioxidant properties of taurine. In summary, CrossTrec BCAA BOX is an extremely ingenious supplement, perfect for any athlete. The product is based on the popular branched chain BCAA amino acids, but additionally contains compounds which complement and enhance their action. As a result, the supplementation significantly increases physical capabilities of the body, delays the occurrence of fatigue and shortens the time needed to regain the strength after the intense physical exercise. 1 or 2 portions (1 portion = 1 sachet) per day. Dissolve the sachet in approx. 300 ml of water, drink before and after exercise. The product prepared for a workout people, for best results, limit the intake to the workout days. The preparation is intended for the time around of trainings, therefore the supplementation should be limited only to the training days. There is no need to take the supplement on days off from physical activity. Each sachet contains one portion of the supplement, it contains only active substances, without any additional fillers. The powder dissolves in water easily, has a pleasant, refreshing taste. It is the best to take one portion before the training and the other immediately after it. This will allow you to increase the endurance of the body and reduce the degree of muscle damage as a result of the intense exercise.